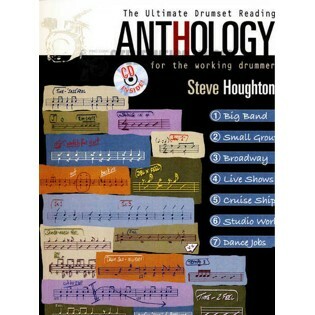 Steve Houghton's Ultimate Drumset Reading Anthology is a diverse collection of drum charts that comes with a CD of accompaniments recorded both with drums for demonstration and without drums for playing along, and includes analyses and performance suggestions. Performance settings like big band, small group, live shows, Broadway, studio work, dance jobs and cruise ships are discussed in terms of responsibilities, challenges, expectations, awareness and problem areas. 72 pages. This book is pretty worthless. the tracks are not play alongs. the advice is common sense. the charts are nothing special. I say "boooooo"